At the request of a friend I recently took on this unusual commission. Because of their height and joint problems, off the shelf ironing boards were too short for them. So this meant raising the working height of a board to 120cm. I did some cursory research into a scissor-jack arrangement for the legs initially, but this rapidly became obvious would make it a complex and expensive build. Due to budget constraints, the simplest solution won out. Extend the legs. 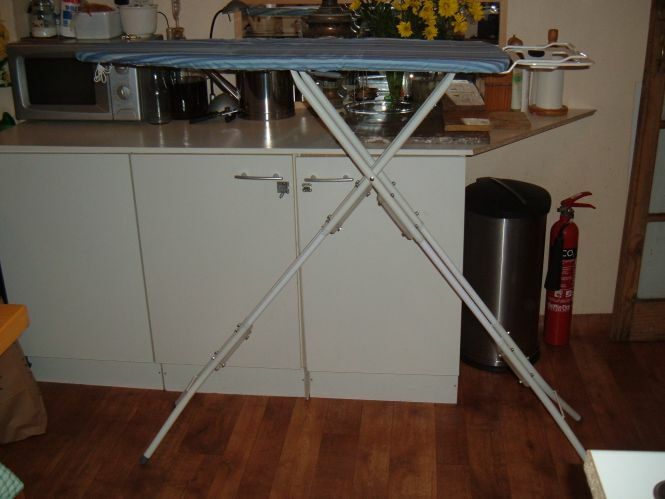 I bought a basic ironing board with double-span legs, aware that the extensions would potentially flex a lot more. 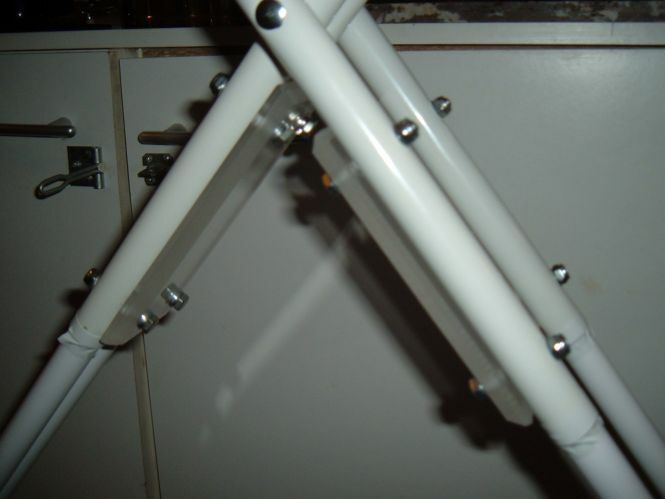 A double set of poles on each leg would mean limiting this, as well as preventing any twisting and stability issues. The tubing had a convenient OD of 22mm. Using some thicker white-coated steel tube of OD 19mm, I packed out the errant half millimetre to make the tubes a snug push-fit. Simply bolting the tubes in place would possibly work, but I wanted to be sure all twisting would be eliminated. This meant making up some bracing plates. These were made from some thick polycarbonate with a nice patina on the rear, and the edges were bevelled on a bandsaw to keep sharp edges to a minimum. The cut ends were filed, but also double-wrapped with white tape to keep things tidy. At this point a problem presented itself. A manufacturing defect in the original board. One foot was slightly malformed. At the normal height this was barely evident, but at the new one meant the board tilted dangerously. In attempting to correct this the tube partially collapsed, compounding the problem. However I found a way around this by inserting more narrow-gauge pipe inside the foot and wedging it in place. While the kink is still visible, the foot is now stronger than it was origionly. Of course, if the foot begins to buckle, I’ll be glad to accept the board back for repair or replacement. This is unknown territory, afterall. One minor issue with this design is the stored size of the board. The mod has added a little under 90cm to the height of the folded board. However when in use the footprint remains the same. Overall it’s been a simple enough build, and one I’ll be glad to do again, even for such a low price of £60. This entry was posted on Tuesday, July 15th, 2008 at 12:39 am	and is filed under Commissions. You can follow any responses to this entry through the RSS 2.0 feed. You can leave a response, or trackback from your own site.